The VOOPOO Drag Mini Starter Kit with Uforce T2 Tank features a built-in 4400mAH battery and smaller footprint than the original Drag Mod. The Drag Mini comes available in eight colorful resin panel designs. 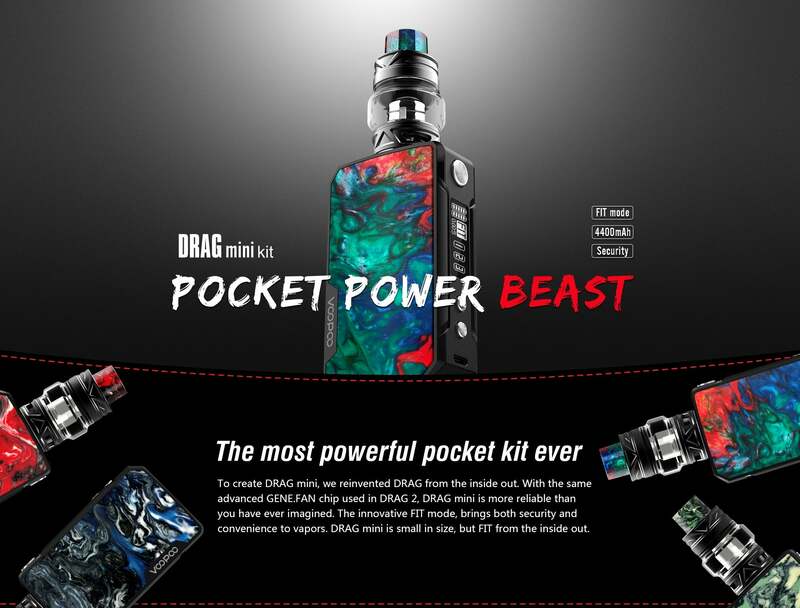 The VooPoo Drag mini kit also adopts GENE chip for a high-performance vape experience. This Mini version of the VOOPOO Drag is everything the VOOPOO Drag 2 157W Box Mod is and more. This smaller version is easily portable and no issue to carry. It also includes a high-end technical design, that is sleek and eye-catching. There is a crystal clear OLED display screen that shows current battery level, what mode you're in, the resistance/voltage and of course your wattage. The VOOPOO Drag Mini features a built-in battery that has the newest chip-set that supports VW/VPC/TC/TCR/BYPASS modes. It can fire up to 117W max output. The Uforce T2 tank has a 5ml capacity and uses mesh coils that bring you the most flavor out of your vape juice.